Stephen: I realized I wanted to be a writer when I was in junior high school. I spent a lot of lazy, summer days in rural Michigan lying on a blanket in the grass reading mystery and spy novels and dreaming of writing them myself one day. Circuitous educational and professional paths have sent me into various worlds—engineering, law, television media, and non-profit management—but writing mysteries has always been in my veins (where it battles coffee for ultimate supremacy; blood is a distant third). Stephen: That’s an incredibly hard question, but I’ll go with the combination of “A Light in the Attic” and “Where the Sidewalk Ends” by Shel Silverstein. The vivid imagery that gushed from Silverstein’s pen to my impressionable mind forever stuck with me. They are now among my daughter’s favorite books. Stephen: My writing day is not so much a “day” as a “When can I find 60-90 minutes?” approach. A full-time job running a national health services organization and an active family life centered around a nine year-old tornado keeps me “swamped” until close to nine o’clock most evenings. So typically, on weekdays, I write at my kitchen table (occasionally with a glass of red wine and always with a selection of candy—because everyone needs more candy!) after nine. On weekends, I typically rise in the pre-dawn hours and write in my basement in the dark (swapping wine for coffee, but keeping chocolate and licorice at the ready) until the tornado kicks up her heels. Stephen: The most surprising, and interesting, thing I learned while creating this book relates to the inner workings of a cruise ship. 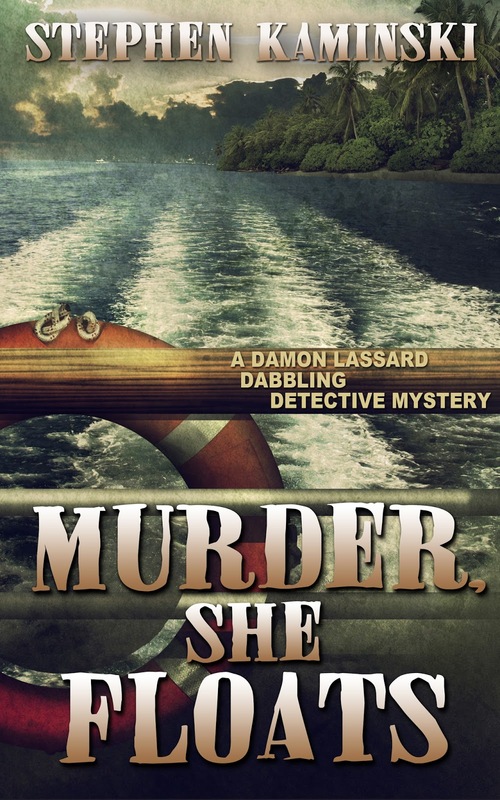 Murder, She Floats is set on a Caribbean cruise. In conducting research, I spent time exploring many crew-only areas of one of Royal Caribbean’s largest ships—the bridge, dining hall, crew bars, kitchens, theater back-stage areas, etc. The bowels of a massive ship is like a city unto itself and seeing these areas first-hand provided me with unique insight that makes the book very believable. Stephen: I have so many! In no particular order: Ken Follett, Lawrence Block, Faye Kellerman, Alexander McCall Smith, Ruth Rendell, Jeffrey Archer, P.D. James, M.C. Beaton, Jonathan Kellerman, John Sandford, and Agatha Christie. Stephen: It’s a secret for now—something similar in style to the three books in my Damon Lassard Dabbling Detective series, but different. Don’t worry, there will surely be at least one dead body! 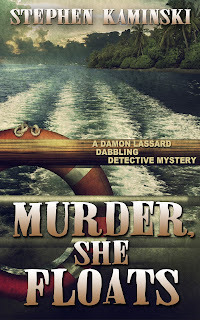 STEPHEN KAMINSKI is the author of the Damon Lassard Dabbling Detective series published by Cozy Cat Press. The first three cozy mysteries in the series are It Takes Two to Strangle , Don’t Cry Over Killed Milk , and Murder, She Floats . Each of the three has won a Reader Views Literary Award and Don’t Cry Over Killed Milk Don’t Cry Over Killed Milk won the 2014 Murder & Mayhem Award for Best Classic Cozy and was a finalist in both the 2014 Clue Awards. Stephen is a graduate of Johns Hopkins University and Harvard Law School. He serves as the CEO and Executive Director of a national healthcare association and lives with his wife and daughter in Arlington, Virginia. Thank you for the introduction to this new author! I'm adding his books to my TBR list. I am going to have to check out some of the other books you have. Thanks for the introduction to a new author (new to me).